Summary: Wayne fans will love seeing the album performed live. 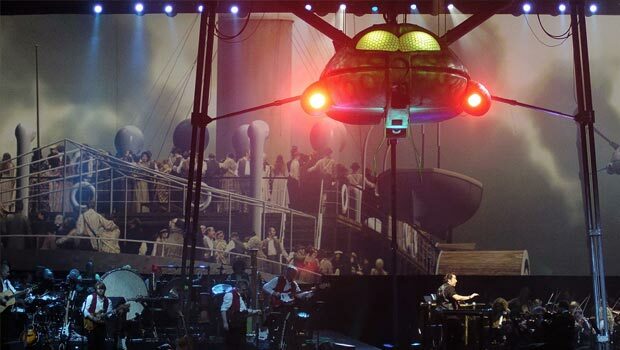 Jeff Wayne’s musical version of The War of The Worlds is one of the most popular recordings of all time, selling 15 million copies around the world. Based on the classic H.G. Wells novel and originally released 30 years ago, it’s no surprise Wayne has taken the step of putting the music on stage given the huge fanbase and the opportunity to deliver a show to match the much-loved tunes. This performance filmed at the new Wembley Arena in London sees his blend of narration, live music and vocal performances, theatre and CGI visuals in action, more reminiscent of the 1953 film than Steven Spielberg’s glossy 2005 update. Those who have heard Jeff Wayne’s rendition of The War of The Worlds will already know what to expect from the score. Kicking off with a dramatic orchestral opening, Wayne brings in synths and gritty guitar hooks as the Martians attack, then switches to more sombre vocal-led tunes to reflect the human mood as Earth is taken over by the invaders. This aspect of the musical is as you might expect: Jeff stands conducting the orchestra while guest singers perform live and act out their parts in true musical style – it’s the added extras that make the show a such a spectacle. To retain the late Richard Burton as journalist narrator George Herbert as a live part of the show, Wayne’s team bring him to life in the form of a ten-foot high, 3D sculpted talking head that hovers over the stage. His well-spoken words, sounding much like a BBC television announcer of old, are one of the most treasured elements to the original recording and bellow out across the crowd from an 80s-looking moving graphic, lending a kitsch look matched by the rest of the visuals. A screen at the back of the stage brings H.G. Wells’ story to life with CGI images which again have a simplistic 1980s look about them and when a 35-ft, 3-tonne Martian Fighting Machine that descends ‘from the gods’ firing Heat Rays at the audience and scanning them with its bug-like eyes, it’s more of an amusing diversion than a show-stopping experience and for all the effort that has gone into lifting this musical out of the ordinary, it never feels as cutting edge as it could be, but then that may be the point. The 1970s synths, whimsical songs such as “Forever Autumn” and a stage production more kitsch than hi-tech give the show a real blast from the past appeal which aptly plays on the fantastical imaginings of a Martian invasion which have long been a sci-fi favourite and Wayne fans will love seeing the album performed live. Pretty much as much as they could find to complete the package to celebrate the 30th anniversary. interviews, commentary, and exclusive behind the scenes footage. It also features a documentary into what it has taken to produce this project, a special edition of the classic HG Well’s novel from Penguin with new photography from the show and a postcard print of the new 30th Anniversary poster.